Breathe new digital life into your old and new transducers. The market leading active sensor in a module case to allow use with existing transducers already fitted to a vessel. 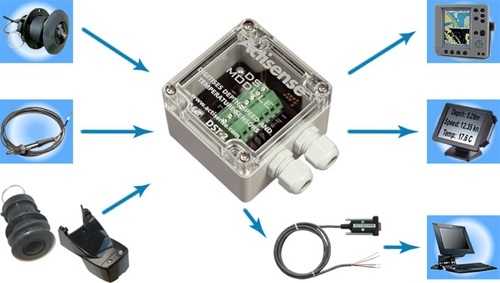 Digitizes Depth, Speed and Temperature transducer signals into NMEA data. Ideal for operation with any NMEA 0183 instrument - e.g. chart plotters and radars. Designed for use with most existing analogue transducers already fitted to a vessel, or new analogue transducers. Our industry proven depth sounder algorithm has the best-in-class seabed tracking, and when in conjunction with a good quality depth transducer, can track the seabed down to 0.3m or 1 foot (proven with Airmar transducers). 100W peak depth power enables a maximum depth range of 200m or 660 feet under optimum conditions (proven with Airmar transducers). 170KHz depth transducer for enhanced interference rejection (from other sounders) Standard frequencies 150 & 200kHz are also available. Log transducer and temperature thermistor interfaces allow additional data to be provided over the NMEA data stream, giving a cable saving. Easy reprogramming of the DST module’s software is possible, to include the very latest software enhancements or customizations. The DST module’s data interface is configured for NMEA 0183, but can operate as a fully bi-directional RS485 interface for customized applications, such as an on-board multiple depth sounder network. Powerful digital signal processor. A high-speed microcontroller capable of 10 million instructions per second, and a large memory to handle the advanced digital signal processing techniques required to calculate the depth of water below the vesel, vessel speed, distance travelled and water temperature. Class leading depth performance. Depth performance in a class of its own, with an industry leading shallow depth capability of just 0.3 metres / 1 foot (below 10 knots), and a maximum depth of 200 metres (depending on the transducer type). Proven depth algorithm. The depth processing algorithms have been fine-tuned over an 6 year period and represent the best-in-class available for calculating the correct depth, even under difficult conditions - at speed, with layers of algae, turbulence and interference from other vessels. Optional depth frequencies. Three variations of the module are available to match an existing depth tranducer's frequency - 150kHz, 200kHz or 170kHz. Speed tracking algorithm. Speed calculations can accurately track even the smallest changes in vessel speed, with a resolution of 0.1 knots. Temperature algorithm. A thermistor can precisely measure the water temperature around the transducer, with a 0.1°C resolution. * Depth: connects to a standard piezoelectric depth transducer crystal element using a three-wire interface. * Speed: connects to a standard 'paddle-wheel' hall-effect speed transducer using a three-wire interface. * Temperature: connects to a standard metal case thermistor transducer using a two-wire interface. IP66/IP68 case and grommet design. A robust polycarbonate case with a high waterproof certification. The small case size is ideal for space restrictive applications. High quality angled screw terminals. The 'moving cage' type terminals make cable installation a simple and quick operation. NMEA 0183 full-differential output driver. Can drive up to 4 fully compliant NMEA 0183 device loads, with a 10mA (maximum) drive capability. The full-differential output ensures better quality communications and lower noise emissions on unshielded twisted pair cabling. Simply wire to a device capable of showing NMEA information to view all the NMEA data. NMEA 0183 sentences output. Depth (DBT and DPT), Speed (VHW), Distance Log (VLW) and Water Temperature (MTW) sentences are output once per second. Wide battery input voltage range. For maximum compatibility, any battery supply between 11 and 28 volts can be used. Very low current consumption. Ideal for small vessels with small batteries. Customize service available. 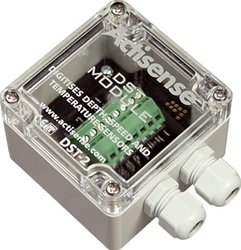 Actisense™ offers a full user configuration service for the Active DST Module range. The module can be fine tuned to match each customer's individual requirements - be they different Baud rates, faster/slower data output rates, and/or specific data output formats, or even a different depth frequency.